Ludington is a top vacation destination in Ludington, and Ludington Pier House Motel makes your stay here even more enjoyable. Their reputation is well known for staff friendliness, clean, comfortable rooms and the best location in town. This motel is a family-owned business with employees who take great pride in catering to the needs of each and every guest. 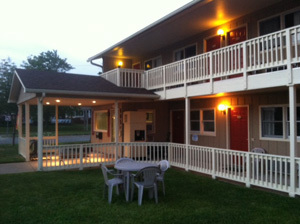 The motel has undergone recent renovations and has been newly remodeled. Located right across from Stearns Park Beach, Ludington Pier House Motel has received the Trip Advisor Excellence Award for many years! 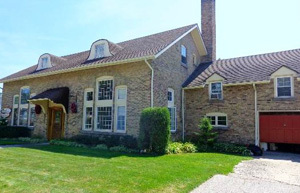 Ludington Pier House Motel has a variety of rooms to suit any needs. If you're on a romantic getaway, choose a room with one queen bed, refrigerator and coffeemaker. Bringing the kids? Pier House Motel has rooms with two double or two queen beds...or stay in a family-size room that also includes a twin bed and microwave. Stay on the first or second floor, and enjoy beautiful sunsets from the balcony of the Lake View room. You will feel right at home with the comfortable beds...guaranteed for a good night's rest. Located Close to Vacation Fun! Just across the street from the motel is the fantastic Stearns Park Beach on Lake Michigan. In addition to the large beach area and swimming areas at Stearns Park, you'll find a playground, shuffleboard, mini-golf, grassy area with grills and picnic tables, and a Skate Park. For exercise, walk out on the breakwall to the North Breakwater Light...or take your fishing pole and try your luck at catching some trout, walleye or bluegill. You're also within walking distance of downtown Ludington with its great shopping and restaurants, Waterfront Park which is nestled between two marinas, and the S.S. Badger carferry dock. You simply cannot beat the location at Ludington Pier House Motel! Is the weather less than perfect? Too windy? Too cold? Not enough sunshine so that you can soak up some rays? No worries! You can swim and relax inside even when the climate outside isn't the best for spending a day at the beach. 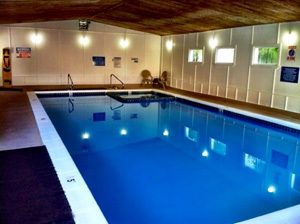 The Ludington Pier House Motel is the only lodging facility which offers and indoor heated swimming pool and spa near the beach. 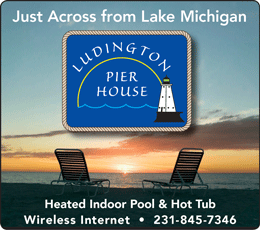 If you are looking for a lodging bargain, Ludington Pier House Motel offers many specials throughout the year. Of course, summer is Ludington's most popular season, and mid-June it's Macker time! The Gus Macker 3-on-3 Charity Basketball tournament brings thousands into town, and the Pier House is in the heart of the action! July 4th is also a popular time...enjoy free food while you watch the Freedom Festival Parade. Fall brings a special kind of beauty to this section of Michigan, and with less crowds, this may be the perfect time to visit. If you're planning a wedding, reunion or special event in the Ludington area, be sure to book your rooms at Ludington Pier House Motel. You'll receive a 10% discount when you reserve 10 or more rooms. You won't find a better value for your money than at Ludington Pier House Motel, along the beautiful shores of Lake Michigan.